Video games are popular, and advancing technology assures that they aren’t going away anytime soon. There’s an ongoing debate about whether or not video games are bad for you, and since this is a blog, I get to put in my two cents! Personally, I feel that a moderate amount of gaming is actually good for you. There are games that are designed to help improve your memory, work through logic puzzles, and learn new facts through trivia. There are even games that get you to exercise! Apart from obvious choices for “positive gaming” experiences, there are also sports games. I’m proud to say I have every Fifa game put out since 1996. In my opinion, sports games don’t just allow you to have fun (which is always great), but they help you with simple things such as reaction times, and vision within the sport. I do believe you can help your understanding of a sport by playing some sort of simulation like a video game. 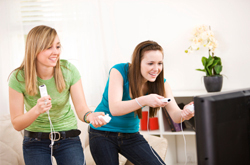 Also, check out this blog entry on how much video game time is too much by Dr. Michael Rich, Children’s Hospital Boston’s “Mediatrician”.